Make a plan ... to get ready for Christmas! Small, sweet and colorful, we love this crafty ring-bound planner from craft designer Erica's Doing Something Else! Erica used commercial scrapbooking products to create her little planner. With simple ring binding, pretty dividers and a free printable for small-sized planner pages, it packs a lot of organizing power in a tiny creative package. Better, this would make a great "scrappy" project to use extra chipboard and bits and pieces of holiday-themed scrapbooking paper to good effect. 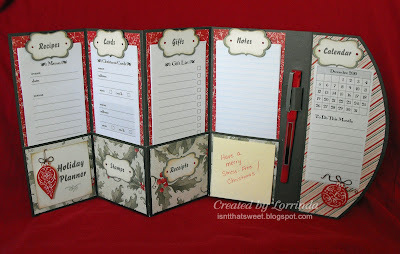 Add some down-sized planner pages from Organized Christmas, and you could create your own planner for pennies .. or less! Looking for an easy way to bring designer dazzle to your Christmas planner? Take a tip from craft blogger Paper Pile Kitten, and tap digital resources to create your holiday organizer! This pretty, practical planner incorporates hand-written notes, digital scrapbook downloads, stamps and stickers to create a one-of-a-kind holiday planning powerhouse. We love the strong red-and-white design, the eye-popping embellishments, and most of all, the simplicity of using a digital template to create a Christmas planner. Ready to make a sweet and creative Christmas planner with help from design blog A Cherry On Top? Check out this fabulous tool for an organized Christmas! With a page-by-page tutorial, you'll be guided through each step of creating and assembling this little book. While the project uses a Zutter Bind-It-All to assemble the planner, the ideas could be adapted for use in a composition book or loose-leaf format, too! Pretty and practical. A winner! How about this beautiful entry in the creative Christmas planner category? Created by Sue at the C&T Publishing Blog, it's a fabulous example of creativity at work. Sue's combined multiple products and crafting methods to create this lovely holiday organizer. Custom-sized pages, sewn construction and die-cut letters make this planner useful; an integrated small binder insert holds receipt envelopes firmly. Use of durable cover materials such as cloth and twill tape means this binder will hold up to use much better than a paper-based Christmas planner. Finally, a notable innovation: at season's end, Sue plans to turn this binder into a holiday memory book. She'll swap out organizing pages and replace them with Christmas photos and journaling. What a great idea! Celebrate Christmas in July with this sweet, simple Christmas planner from Carrie at Paper Glitter Stamps! With before-and-after photos, her blog post shows how a humble dollar-bin planner got a stunning vintage makeover. Using antiqued paper, embellishments and lettering, Carrie's planner includes a reproduction of a vintage Christmas card for the perfect holiday touch. Think all Christmas planners have to be girly or cute? Guess again ... and check out Lorrinda's fabulous faux leather Christmas Planner! On the outside, it's svelte and swanky with an easy faux leather finish; on the inside, it's a hard-working tool for Christmas organizing. Along with gift lists, card lists and menu planners from Organized Christmas, Lorrinda's added grace notes like a Post-Its pad and pen holder. 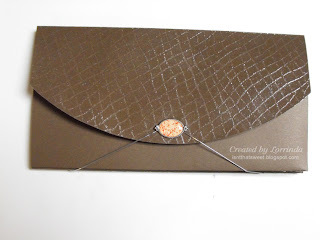 Best of all, Lorrinda's Isn't That Sweet blog offers a fully illustrated tutorial to help you create your own version of this clutch-purse holiday organizer. What's better than a fresh, new Christmas pocket planner? Three of them! Check out this trio of inspiring Christmas planners from Lisa, blogging as Melt Your Heart Greetings. Coordinated patterned papers and luxe embellishments lead to three very different approaches to the Christmas pocket planner concept. Lisa used a software program to create her calendar and gift list inserts, but to make it simpler, grab the Christmas pocket planner forms from sister site Organized Christmas ... and get creative! Declutter 101: Where Do I Start? Cleaning Challenge: What's Your Number? Copyright © 2008-2018 by Threadneedle Press LLC. All Rights Reserved.